Tonight at Big Car Gallery! It’s the first Friday of November so you guys know where I’ll be tonight! I’ll have the table set up at the same bat time, same bat spot: right outside the Big Car Gallery. I’ll be joined again tonight by Vouched contributor-extraordinaire Tyler Gobble. Also, new to the table tonight is If I Falter at the Gallows by Edward Mullany (Publishing Genius Press), and with all do luck, Ayiti by Roxane Gay (Artistically Declined Press) will be sitting on my doorstep when I get home, ready to be sold to the world. But I’m not the only thing happening at Big Car tonight. No, no! 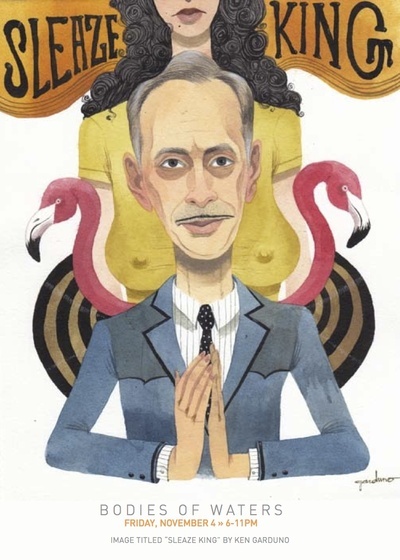 Bodies of Waters, part of Spirit & Place, will bring pieces based on John Waters’s films that some of the nation’s top pop surrealist artists and illustrators as well a few local favorites created specially for the exhibit. iMOCA in partnership with Big Car Gallery put the exhibit together to celebrate the appearance of filmmaker John Waters on November 12 at the Madame Walker. Artists participating are: Glenn Barr, Yumiko Kayukawa, Amy Casey, Paul Chatem, Shaunna Peterson, Lola, Danielle de Picciotto, Lisa Petrucci, Elizabeth McGrath, Kristen Ferrell, Angie Mason, Aunia Kahn, Ken Garduno, Mab Graves, Jacqueline Pichardo, Philip Campbell, Kenneth Rehm, Casey Roberts, and Floyd Jaquay. So come out and see some awesome, Waters-inspired art. Check out the book table. Meander through the Murphy maze of other galleries, shops, and beer rooms. It’s going to be a good night. Hope to see you there! Yeah, man. I wish you could’ve been in town for the gallery show last night. I think you would have really loved it. Ayiti didn’t make it yesterday, which is a bummer, but it’s all good. I have a table this coming Saturday, and I think it’s going to do really well there. i would have loved it for sure. i’ll have to start checking out those other artists. its missing things like that makes living in a small non-urban area always feel like a downer, haha. i’ll track it first thing monday when i get to work, just to give you an idea. can’t wait for it to rawk the party with you! Sweet dude. I highly recommend checking out Mab Graves if you’re thinking of checking out any of those artists. Her stuff is really fantastic–has this kind of dark, fairy tale feel to it. The Indy are scene is actually a pretty rich, thriving thing. I love it. And no worries about tracking it. It’ll honestly probably get here on Monday. I can’t imagine it not being here by next Saturday, either way, and that’s what’s important.